Our youngest chickens have started laying eggs. They are so much smaller than the older chicken eggs. It is pretty amusing! The first of these eggs we found was not in a nest box. It was out in the grass. Then we found one on the floor of the coop. Obviously, these young ladies were new to this and needed to learn what the nest boxes were for. So, I caught each one separately and stuck them in one of the nest boxes to give them a chance to look around and, hopefully, figure out the appropriate place to lay an egg. However, the next day, I found yet another egg on the floor of the coop. Then, I noticed that all the nest boxes were in use by the older chickens. Hmmmm. Could it be that we needed another nest box to accommodate everyone? Tom built the first set of nest boxes, but we truly do not have room for another set that big. We hardly have room for even one additional nest box. Plus, it is a busy time in the garden and I didn't want Tom to feel he had to spend a lot of time building a new nest box. I had seen already-built nest boxes somewhere and decided to go "nest shopping". I found one at our local Atwoods farm store. It is made of plastic and will be easy to keep clean. It was also easy to install with only 4 screws required. Here it is. As soon as it was installed, I went through the routine again of picking each young chicken up and putting her in the new nest. I was rewarded the next day with this. So far the only eggs I have found in it are little eggs laid by the young girls. I think perhaps it is too small for the Rhode Island Red chickens' liking. They are a large, heavy breed and the opening to this new nest box is a little smaller. So, I really do not expect them to use it. However, that is okay. It is just perfect for the young chickens and they will have their own special box. A few weeks ago I posted a picture on our Windy Acres Facebook page about our new arrivals, a pair of peafowl. A peacock and a peahen to be specific. The peacock is on the right. He has a longer tail, but has yet to develop his full plumage because he is only a year old. They do not get their full set of tail feathers until they are 3 years old. These were a gift from my middle child who decided we could not have 5 acres without a peacock to go with it. We had to build a shelter for them and were told we should keep them penned up for several months until they were used to the place and knew they could come back here to find food. 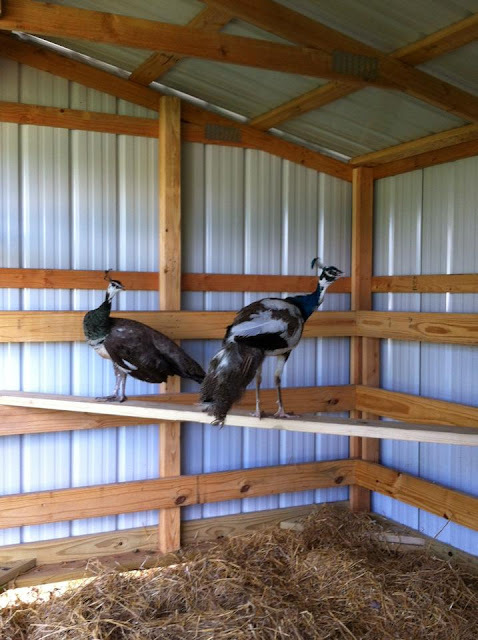 They were both rather wild when we got them from the breeder, having been raised in large pens with lots of other peafowl where they were often chased down and captured with large nets when a buyer came to purchase one of them. This wildness caused them to become frantic and fly around the enclosure in a panic when we went in to give them food or water. And, unfortunately, after about a week, the female escaped when she flew against the door while Tom was in there to take care of a spilled food container. She flew over the fence and into the tall Johnson grass on our neighbor's property. We were both just sick about it and, although Tom went to look for her, it was a hopeless endeavor. There is a creek with some tall trees beyond the grass and there is no telling where she might have gone. We left food outside the pen, hoping she would come back to eat, but that did not happen and we have not seen anything of her since. There is a silver lining to this story, though. With the female gone, the peacock has settled down considerably. She was definitely the wilder of the two and got agitated at the slightest thing. The male has tamed down so much, in fact, that I can now enter his pen without him getting agitated at all. Isn't he a beautiful boy? He is an India Blue Pied. The regular India Blues do not have the white feathers. We bounced several names back and forth. We agreed his name should start with a "P". I was all for calling him Pete, after the OSU mascot Pistol Pete. But, Tom felt he should have an Indian name, like Piscine, the name of the boy in the book Life of Pi. In the end, we decided to call him "Petey Pi". Although you can't see it, the front of the shed is covered with chicken wire. It serves two purposes, one to keep him in, but also to keep predators out. Believe it or not, peafowl, as large as they are, can fall prey to raccoon, coyotes and owls. In Petey Pi's case, he is more susceptible to predators at night because of his white feathers. As soon as we can, we plan to build an outside enclosure attached to the shed to allow him outside access during the day. Later this year, we hope we will be able to let him out to free-range. The only problem with that is he will undoubtedly stray over to our neighbors, too. So, we'll have to see how that works out before we make it permanent. In January of 2012, I wrote a blog entry about the severe drought we were having here in Oklahoma. Later that spring, the rains came and we were officially out of the drought for several months. But, the rains stopped and the drought again crept into our part of the state so that by January of 2013 we were back in a severe drought. During those dry times, we struggled to keep the garden alive and producing. I dreamed of rain and lakes and rivers full of water. 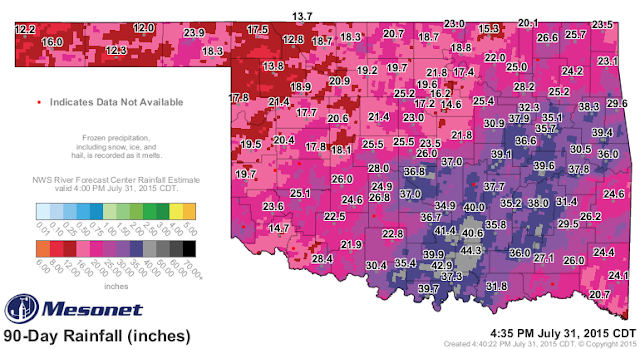 Well, my dreams became a reality this spring when Oklahoma received record-making rainfall. Here's a Mesonet map of the rainfall totals that have fallen in the state in the past 90 days. Unfortunately, this has caused more problems for us than the drought. It was so wet for so long that we didn't get our crops planted in a timely manner. Many of our potatoes rotted in the ground. And, worst of all for me personally, the raised beds that I normally take care of got overtaken by weeds. Here is an embarrassing picture of what it looks like. Normally, I would have mulched the beds with leaves before the weeds got such a foothold, but this spring it was wet and muddy and I just didn't get it done. Now, the weather is hot and humid and I've found that I cannot handle the heat this summer, so I've sort of given up for now. Maybe I'll try a fall garden. As Scarlet O'Hara would say "Tomorrow is another day!" I am trying to be optimistic and put a positive spin on this whole deal. I planted some Mexican Sunflowers that are beautiful, towering above the weeds and holding their own. If you look closely, they are covered with butterflies and bumblebees.. I also have a lot of Thai Basil that came up volunteer from plants I planted last year. Although, I don't use this herb much, I like to grow it for the pretty purple flower stalks it produces. So, all is not lost and life goes on. That is the nice thing about gardening, tomorrow is another day!